We reported on the release of the Cook & Becker Sonic the Hedgehog 25th Anniversary Art Book back in October, and we continue to be impressed the more we see! The original press release mentioned a limited edition This week, C&B have shown a sneak preview of the art giclee print that comes packaged with the Collector’s Edition. 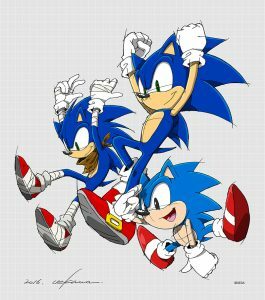 The giclee, commissioned especially for the art book, has been created by Sonic Team artist Yuji Uekawa in his trademark style, and depicts all three major incarnations of Sonic in their own unique, dynamic postures. Fans of Uekawa-san will no doubt be excited to see this great edition to what is already shaping up to be a fantastic compendium of Sonic the Hedgehog history. The Art book with the art giclee print can be purchased through the Cook and Becker website, which can be per-ordered for the special price of £90 (a 10% discount) before February 2017. What can I say. Classic, Modern/Legacy, Boom… Sonic is Sonic at the end of the day, and each art style is pretty good on its own. I started with modern back in 2004 and it remains my preferred style but I certainly appreciate the others. I’ll definitely put some cash aside for this one. Now just waiting for news on Project Sonic 2017, as well as Mania coming soon. Really it’s an extra £50 for a relatively small print. To me, not worth it. I’ll take the regular one. There are actual human beings that woke up, went on the internet, saw that the Sonic art book they pre-ordered comes with a giclee, and cancelled their pre-order because said giclee has Boom Sonic on it. I always found it hilarious how the Boom hatebase actually cares more about the series than the fanbase does. Goes to show you how awful the Sonic Boom franchise is. If Sonic Boom is as awful as you say it is, don’t give it attention. Man who had no interest in buying a thing, finally justifies his reason to not buy a thing. Why is this “25th Anniversary Art Book” coming out after Sonic’s 26th anniversary? I don’t know about you that Sonic 25th Anniversary Art Book looks snazzy.